Many forces affect the outlook for people living with felon convictions with respect to their voting rights. While the prison population is largely declining, there is a large number of people already disenfranchised under current laws. Looking toward the 2016 election and beyond, the status of felon voting rights will continue to be an important aspect of every election. Since a peak in the 1990s, crime has been decreasing year after year. Contrary to the thinking that lower crime is achieved through higher imprisonment rates, the overall incarcerated population has also started to plateau and even decrease in some areas. In fact, 32 states saw declines in both their crime and imprisonment rate from 2008 to 2013. These declines will take time to translate into a significant decrease in felon disenfranchisement, however, especially in states that restrict voting rights past incarceration. 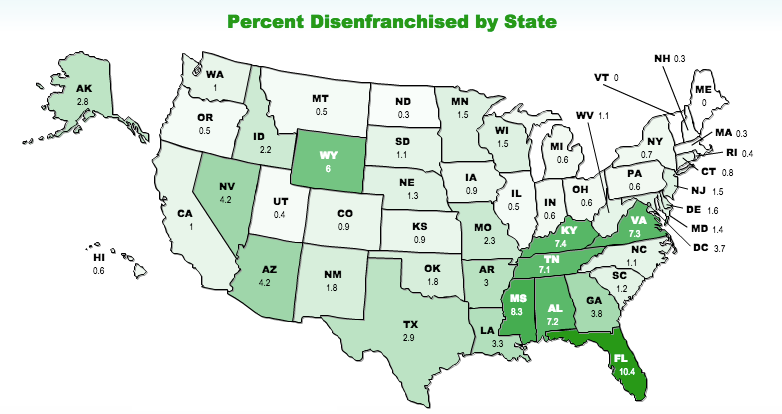 Currently, states range from 0% felon disenfranchisement (Vermont and Maine) to 10.4% (Florida). Heading into the 2016 election, about 2.5% of voting aged people in the United States population will be disenfranchised due to their criminal history. Moreover, a staggering 7.7% of the total African American population will be disenfranchised for this reason, including up to 20% in some states. All told, 5,852,180 people are ineligible to vote due to felon disenfranchisement according to The Sentencing Project.